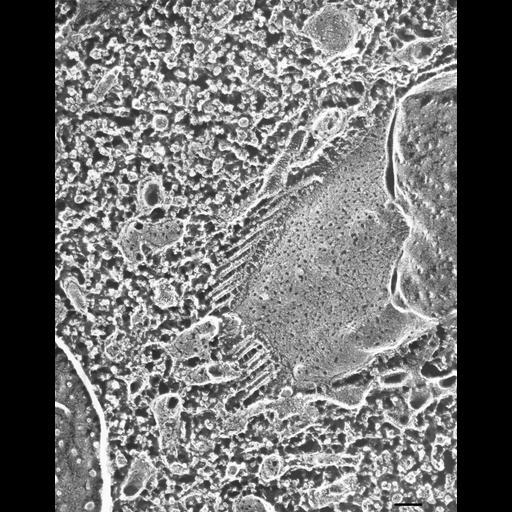 A view of the E-face of the fractured collecting canal of the contractile vacuole showing its association with microtubular ribbons and with the smooth spongiome. The E-fracture face of the smooth spongiome is highly pitted like that of the collecting canal. Thin filaments lie between the microtubules and the collecting canal membrane. TEM taken on 7/19/88 by C. Schroeder with Zeiss 10A operating at 80kV. Neg. 40,500X. Bar = 0.1µm. A print of the negative was scanned and processed in Photoshop. This image is best used for qualitative analysis. A high resolution image (CIL:13126) is available for quantitative analysis. Additional information available at (http://www5.pbrc.hawaii.edu/allen/).